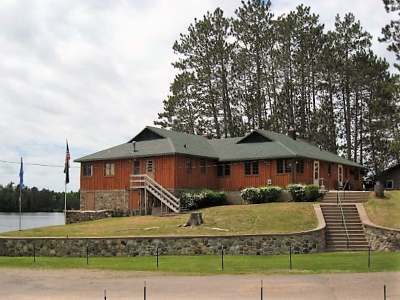 SOMO LAKE CLASSIC LODGE--Although this cool, rustic lodge is currently operating as the successful Tomahawk Lodge Bar and Grill, it can be converted into a unique and very spacious lake home. A little imagination and renovation, and yours could be THE gathering site for friends or family. The "living room" offers expansive views of picturesque Somo Lake, swim friendly, full recreation waters. Entertaining will be easy, with the bar already in place. Add a few walls to create bedrooms, including a master suite that can utilize an existing bathroom and walk-in closet currently located off the kitchen. While completing the new spaces, live in the existing 1 bedroom apartment of the lower level that exits just steps away from the sandy shore. This is part of an 8 unit condominium association w/ over 2.5 acres of shared land, almost 500&apos; frontage, and boat launch. Older garage building is included, plus 2 docks. Also, located on the snowmobile and ATV trail system. WOW!